In 2016 it houses BKLYN COMMONS, a shared office workspace. On May 18, 2016 several board members of Save America's Clocks re-visited the space: Tom Bernardin, Marvin Schneider, Forest Markowitz and Jeremy Woodoff. The owner is committed and excited to be restoring the mechanism and handsome terra cotta facade. 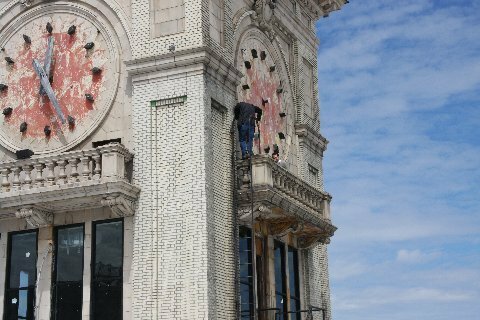 We are proud to announce that this restoration is a designated project of Save America's Clocks. 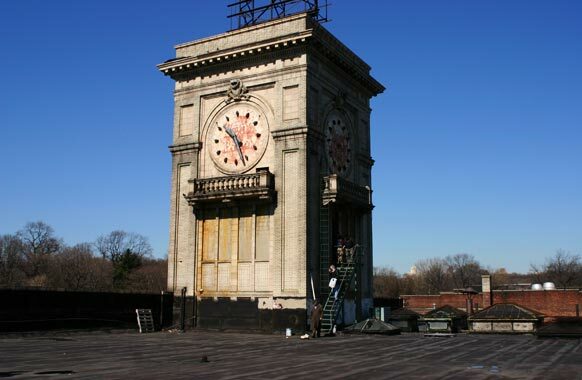 On March 10, 2004, a committee of four visited the great clock tower on Flatbush Avenue: Marvin Schneider, the city Clock Master, his associate Forest Moskowitz, photographer Mark Lentz, and Tom Bernardin, founder of Save America's Clocks. We were able to gain access to the clock chamber up an iron staircase from the roof of the building. The room is not in bad shape. The windows have been sealed so there was not too much pigeon droppings and we found only one dead pigeon. The original mechanism is there, very much in need of repair (which can be done on-site once the room is cleaned and a work table set up). We suspect that the mechanism is a Seth Thomas circa 1915, similar to the one in Pier A in Battery Park. 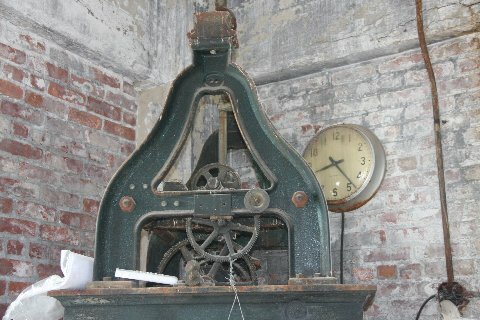 At minimum, the clock must be restored and hooked up to an electric motor. New hands must be installed and gears from the mechanism to the hands installed. Electricity will have to be checked and brought up to code. Scaffolding must be built to gain proper access to the clock chamber and the clock face space (attic) above it. Scaffolding will allow for the clock fades to be cleaned and painted and necessary repointing done. Electricity throughout must be checked, replaced and brought up to code. Clock chamber and (attic) must be completely cleaned. This must be done following OSHA standards. And painted. And lighting provided. A work station must be built to restore the clock. Estimates gathered from clock manufacturers to install the mechanism, provide new clock hands, etc..
Get the clock working once it has been restored. New staircase to the attic installed. 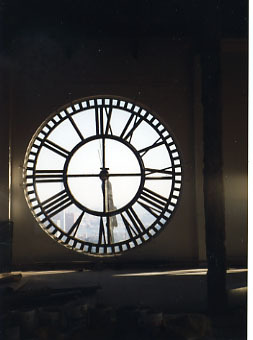 This is a magnificent, high-profile clock and must be restored as soon as possible. Its deplorable state in such a prominent location is a perfect symbol of urban neglect and decay. 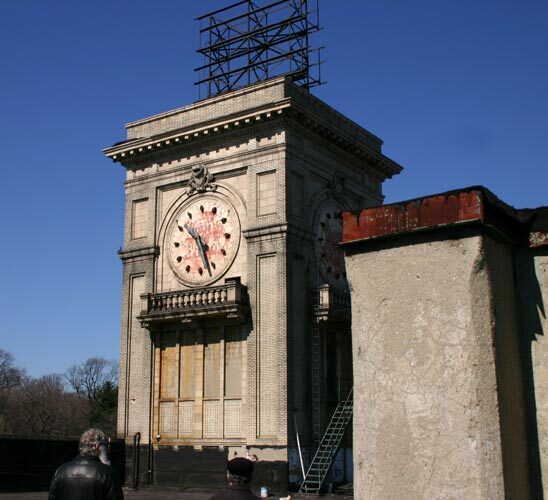 Once repaired it would quickly become a symbol of a new Flatbush, proud of its heritage and serious in its commitment to the future. 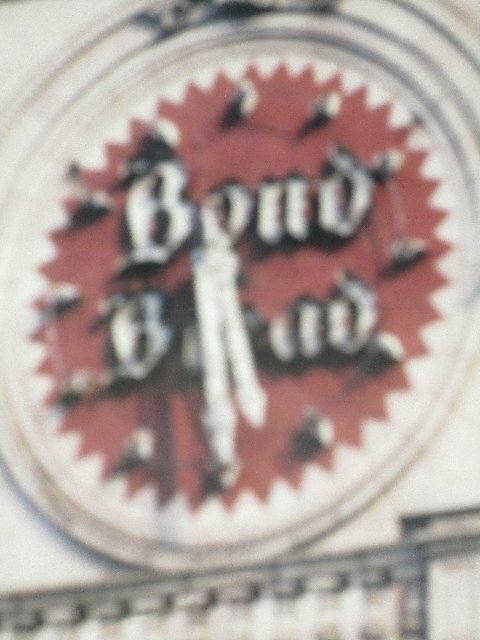 The bank was built in 1927-1929, by the architectural firm of Hasley, McCormack and Helmer. It's one of the tallest buildings in Brooklyn. Four Faced Tower clock. Not working. No mechanism. 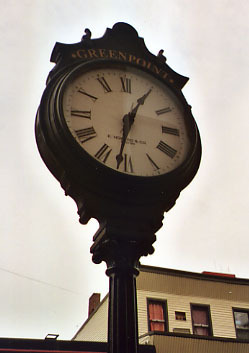 Landmarked post clock. Restored by Department of Transportation. 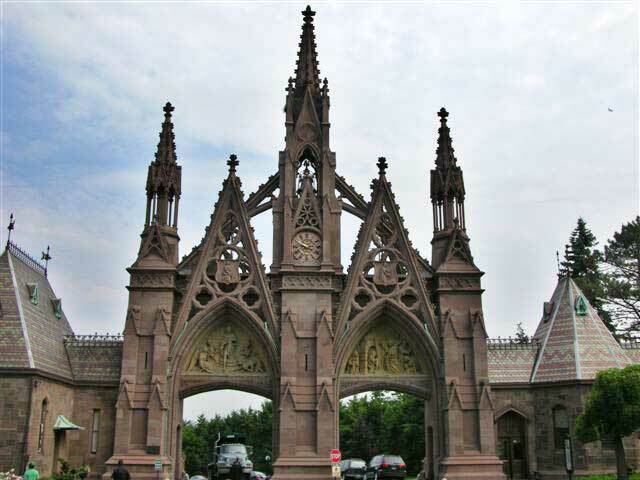 Originally designed and installed by E. Howard & Co. (relocated from its original location at 753 Manhattan Avenue). 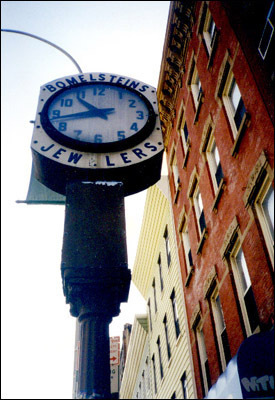 The clock was known as the "Bomelstein clock" at the time it was designated. As part of the Manhattan Ave. street reconstruction that was undertaken by the Dept. 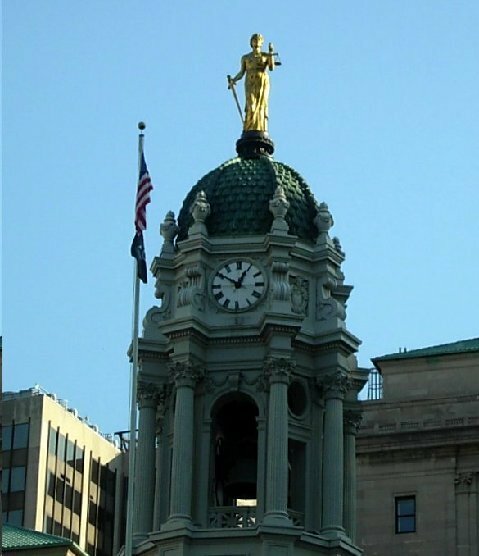 of Design and Construction (my employer), the city relocated the clock and restored it about 15 years ago, including replacing the later top with a reproduction of the original E. Howard top and an electric movement. This large clock head has been hit twice by the roofs of trucks that use this no parking area as a loading zone. Clock is not working. St. Anthony. St. Alphonsus Parish. 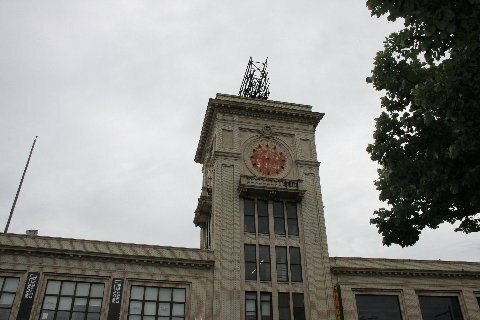 A few of us from Save America's Clocks and the 346 Broadway tower clock lawsuit coalition (see earlier posts) visited Pratt Institute in Brooklyn, NY today to see what was left of the original Self-Winding Clock Co. installations. 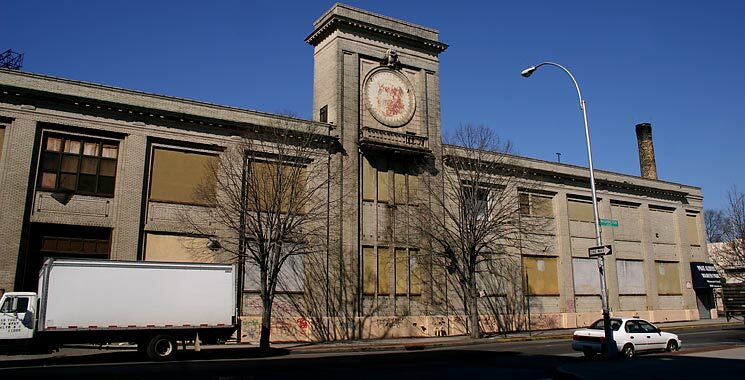 Pratt Institute was founded by Charles Pratt about the same year as he co-founded the Self-Winding Clock Co., whose factory and offices were on Willoughby Street across from the Pratt campus. 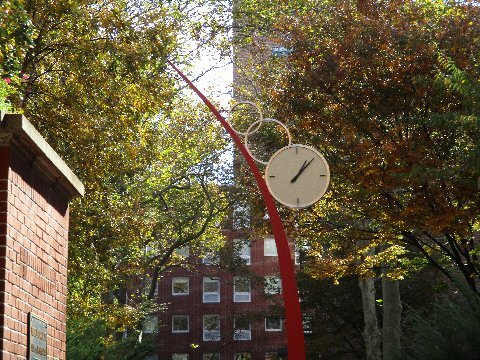 Naturally, all the clocks at Pratt were Self-Winding models. The system has been almost completely removed, but there are a couple of interesting remnants, shown to us by Conrad Milster, chief engineer at Pratt since 1958, until recently. 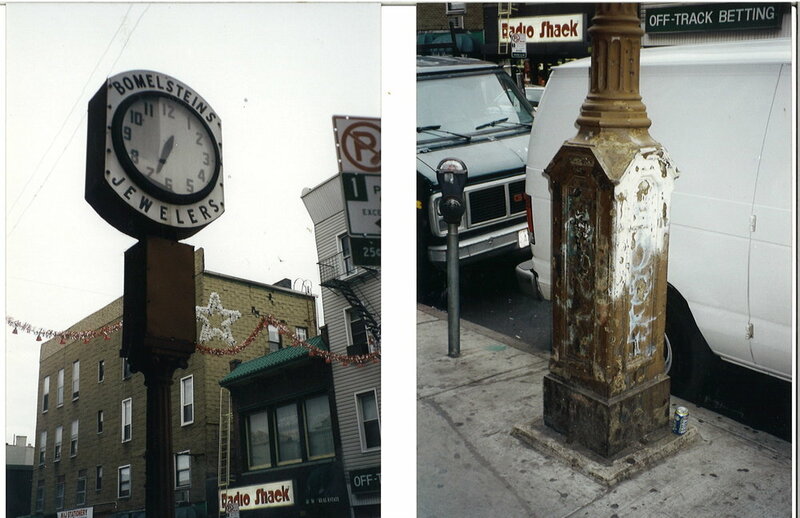 The first group of pictures shows a public clock whose dial is on the wall of the old Engineering Building dating from the 1920s (the engineering program was dropped some years ago in favor of art and architecture programs) and whose original Self-Winding movement is in the room behind the dial. Self-Winding's system for tower clocks was to provide a typical 120-beat domestic-style movement with a twice-per-minute pulse sent to a special tower clock movement that drives the hands. This movement uses a battery-operated vibrating motor, similar to the winding motor in their style F movements, to move a worm gear which advances the hands half a minute at a time. A short video showing this movement operating is here: https://www.youtube.com/watch?v=12gCRMwICXY. The whole setup is tiny compared to a typical tower clock movement. Some time ago the pendulum-operated "master" movement was electrified, and the battery source for the "slave" movement was replaced with mains power, but the setup is essentially original. A second tower clock is high up on the Main (Library) building. It was not possible to fully access the movement, but this picture shows what looks like the original Self-Winding movement, now powered by a small electric motor. 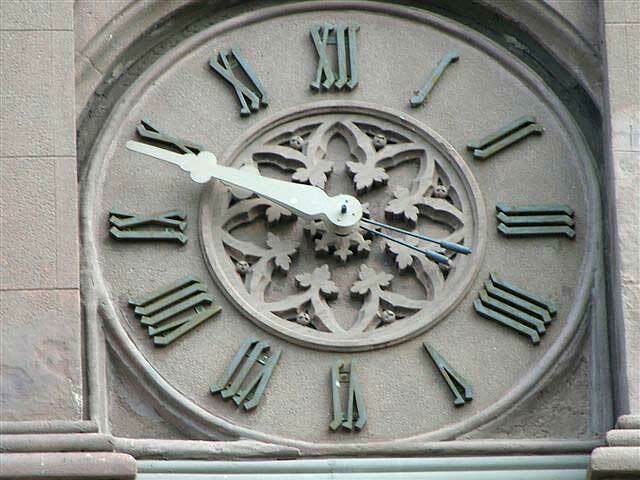 I'm not sure if the set-up was the same as for the previous clock or if it has been altered in the same or a different way. There are a couple of interior Self-Winding clocks remaining on campus, including one in the chief engineer's old office that may have been the original master clock for the campus. 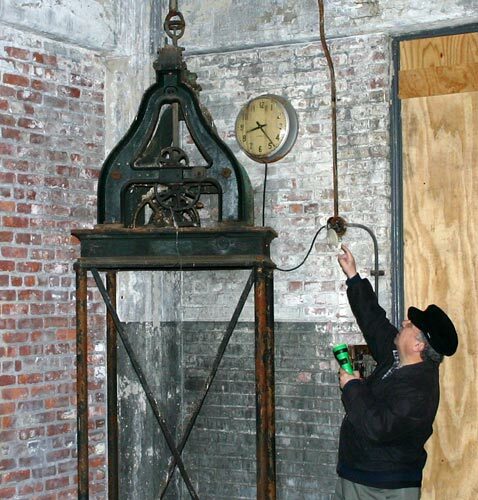 Finally, in the museum-like mechanical building (East Building), is the original tower clock movement from the Ruppert (formerly Ehret) Brewery building in the German-immigrant neighborhood of Yorkville in Manhattan. This clock movement was salvaged by Conrad, the building engineer, and is displayed, working, above the engine room. The steam boiler still heats all the campus buildings and once provided electricity. You can see the dynamos in one of the pictures. 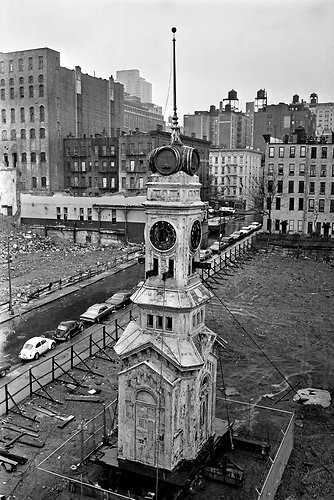 The last photo shows the original Ruppert clock tower after being salvaged from the demolished brewery. It was to have been restored on the grounds of the new development but was destroyed by vandals. Fortunately, the clock mechanism had been removed. I believe it is a Howard No. 2 (photo is from the NY Times).